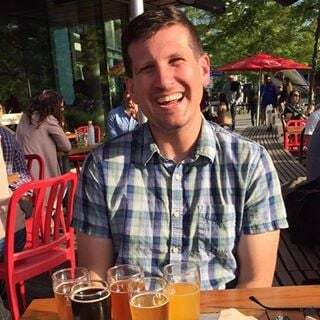 This is a guest post to the Sensu Blog by Michael Eves, member to the Sensu community. 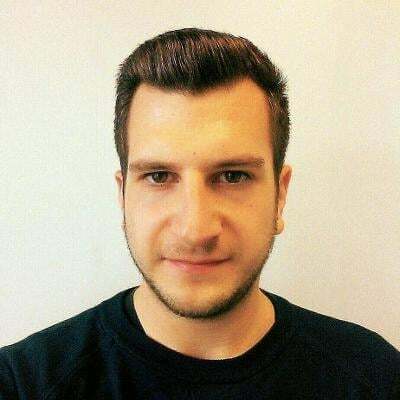 He offered to share his experience as a user in his own words, which you can do too by emailing community@sensu.io. Learn all about the community at sensuapp.org/community. If you’re using Sensu then you most likely already have node level monitoring nailed down to a tee; you’ve probably got some disk usage checks, cpu, memory, etc… the whole shebang. What about if you’re monitoring a distributed service such as Elasticsearch, where the health of that service exceeds the scope of a single node? Well, you probably have that nailed down too. With the use of a roundrobin check and a proxy client a simple check against Elasticsearch’s cluster health endpoint will tell you all you need to know; healthy or not. Where things become more difficult is when you have a service that doesn’t provide its own definition of whether it’s healthy or not; you need to determine what makes it unhealthy and create checks accordingly. Let’s say for example we have 4 web server’s that sit behind a load balancer and serve up some images. The difficulty here is that these web servers don’t even know about each other, they’re unable to tell you the current state of the service as a whole. We’re monitoring these servers with Sensu using a basic HTTP check that curls localhost on 8080 and checks for a 200 response, so we do know the health of each individual node. Now if one node goes down it’s something we’d want to know about, but probably not enough of a concern to get woken up at 2am for. If we lose two nodes however we’re approaching the danger zone, and we want someone to intervene. So, we don’t want to get notified for one node down, but we do for two. Let’s take it one step further and assume we’re anticipating a massive growth in traffic so we scale up, or autoscaling does this for us. We’re now sitting at 30 nodes, rather than 4. Suddenly, two nodes going down is less of a concern; we now only care if more than 6 are down. What is it then that we need to effectively monitor this service? Well we need to be able to aggregate the health of all our nodes and then decide whether the service is healthy based on a ratio of our HTTP check results. This is where Sensu Aggregates come in. Above is the definition of Sensu aggregates taken from the Sensu docs themselves. Essentially, we can group results of different checks from different clients into a single result and then use that result to effectively determine the health of a system. Note: I’ve also set "handle": false since we’ll be alerting off the aggregate, not the individual check results. Awesome! Now we just need to add a check that hits the API for this aggregate and determines if the service is healthy or not based on the number of ok/warning/critical results. Fortunately there is already a community pluginthat comes with a check to do this, check-aggregate.rb. --check frontend_web_health — This flag specifies the aggregate name to check. --critical 20 — The percentage of aggregated results that need to be critical for this check to return critical. --age 180 — How old results in the aggregate need to be before they are considered stale. (I’ve set this to match the TTL of the front_web_healthcheck created earlier). 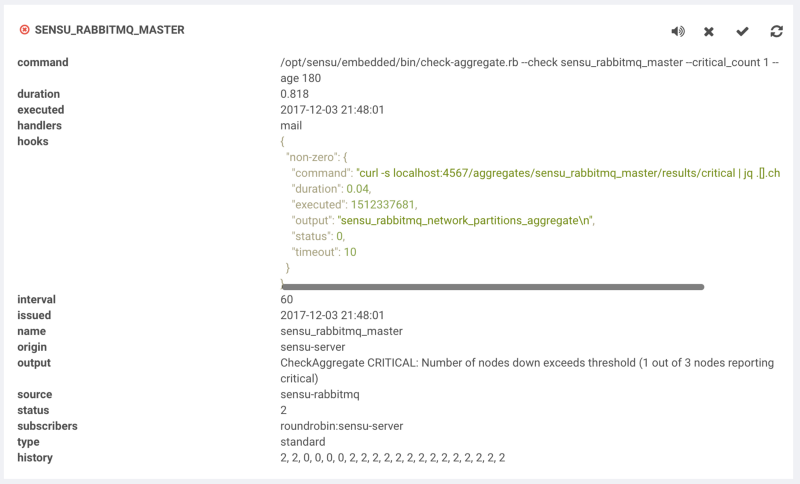 "subscribers": ["roundrobin:sensu-server"] — We’ll run the aggregate check on one of our Sensu servers, since it is just querying the API. (Note: You must create this subscription, it doest not exist by default). "source": "web_frontend" — Creating a proxy client for this check will allow us to view the health of our service on a single client, web_frontend. "handlers": ["mail"] — As mentioned earlier, it makes sense to alert off this check rather than the individual results. We’ve seen how we can create an aggregate of a single check across many nodes, but what if our service has more than one indicator of health, and what if these indicators have different weights in determining if a service is healthy. A way to tackle this is to write checks for these different indicators, aggregate the results of those checks, and then aggregate the results of those checks. Ultimately we want to create a single check to alert on that can tell us in overall terms if a service is healthy or not. Before I continue it’s worth saying that I have not come across this setup elsewhere which may be for good reason. If you simply want to reduce the amount of alerts you receive when a service goes down you should first consider if check dependencies covers your use case. With that being said… onwards! There may be more than just the above, but we’ll stick with just those three to give an idea. The diagram below illustrates what we’re going to setup and how it can be used to provide a single view of a services health. 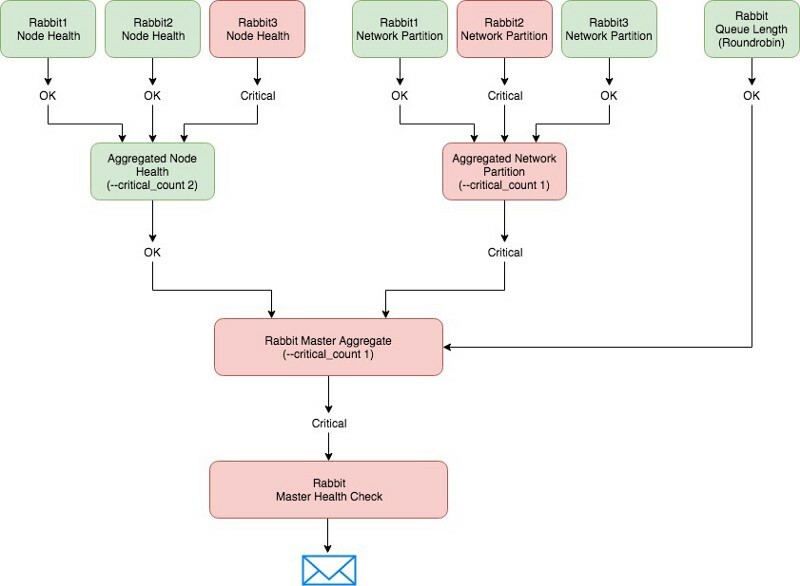 There’s no need to run this check on all the RabbitMQ nodes as they’ll all return the same result, since the queues exist at the cluster level. Since we’re running this as a roundrobin check, there’ll only ever be one result for this check. This means we don’t need to aggregate the results of this check as in essence it’s already been done; we have a clear indication of whether, from the perspective of queue lengths, our cluster is healthy or not. As such, we can aggregate this result into the sensu_rabbitmq_master aggregate. Now that we’ve configured all our checks we should be able to see the aggregated results, under our master aggregate. We’ve set --critical_count 1 here since the results in this aggregate are an overall view of different aspects of our cluster. If there are any critical results in this aggregate, it is a clear sign that something is wrong and needs attention. This is pretty meaningless to us. All we know from this is that one of our “health definitions” is failing, but we have no idea which one. Fortunately, the recent introduction of check hooks means we can extract more information should our check fail. Hopefully this has given you an understanding of how aggregates can work at a basic level, and how they can also be extended out to fit the needs of more complex services. What next for aggregates? What would I like to see? I believe aggregates have great potential to really fill a gap in monitoring that of other tools I’ve worked with simply can’t, and I’m excited to see the creative ways in which people will utilise them going forward. Perhaps you could aggregate checks in an entire datacenter to determine if a datacenter is unhealthy, and automate failover to a passive DC if this is the case? 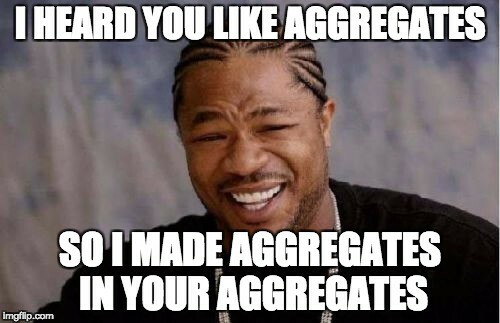 Or maybe you can use aggregates to determine the health of your external services and automate updates to the likes of statuspage.io? Thanks to Matthew (Brender) Broberg.